Trond Anfinnsen is the inspiring sort of guy who gets an idea, commits to it and sees it through to its creative end. And then when he’s done, he starts the process all over again. 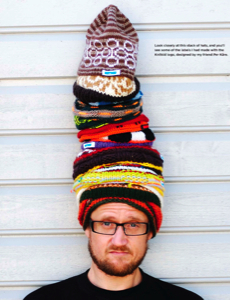 On this episode of CraftSanity you’ll hear Trond, 42, of Stavanger, Norway, tell the story of how he became a ravenous knitter just a few years ago and ended up knitting more than 200 one-of-a-kind hats for people in his life. 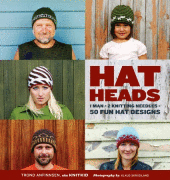 Fifty of Trond’s hats are included in his book: “HatHeads: 1 Man + 2 Knitting Needles = 50 Fun Hat Designs.” I posted the Silje pattern, featured on the lower right of the book cover and p. 116, on this blog a while back and still have big plans to make that hat. Trond’s book is cool because it gives 50 examples of how a simple knitting pattern can be customized for each individual. He even shares some great tips about how to design a one-of-a-kind hat of your own. Unlike most craft books, Trond’s introduces us to all the people who modeled hats for the book. Under each photo is a brief intro to these people and explanation of their connection to Trond. I love the sense of community that Trond created with his knitting. It’s lovely, really. And it so makes me want to knit a hat. Right now. Enter to win a copy of “HatHeads.” Post a comment below about who you want to knit a hat for and why to enter the random drawing for a copy of the book. The deadline to enter is Sept. 8. Good luck everyone! For decoupage penny earrings and more, visit the Wabisabi Brooklyn Etsy shop. MaryAnne LoVerme of Wabisabi Brooklyn turns humble elements into elegant jewelry. The current collection combines vintage jewelry, recycled paper, coins and other ephemera in unexpected ways to create true statement pieces. Buy a CraftSanity T-shirt or button or sponsor an episode. Also, check out my etsy shop to see what I have in stock for wooden looms. Ellen – Congratulations! The whole block’s been rooting for you. ( your cars were misesd and we all started guessing.) He is absolutely beautiful and I’m so glad to see that you are all doing well. Note to Zoe: You are already a great big sister! Hope to see you as soon as you’re up to it!